Munster made sure there will be an Irish side in the Heineken Cup final after beating Perpignan to set up a last-four showdown with Leinster. 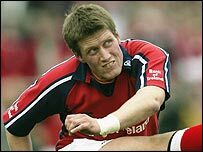 Declan Kidney's side led 7-0 after 20 minutes through a Paul O'Connell try, converted by Ronan O'Gara. But winger Mathieu Bourret hit back with a try, a touchline conversion and then a penalty to give Perpignan a 10-7 interval advantage at Lansdowne Road. Munster secured their semi-final place with four O'Gara penalties. "It was far from vintage but we are just happy to get the win," said man-of-the-match O'Connell. "It was a long way off our performance against Sale but that is the way it is when you have not played together for so long. "I think it must be 10 weeks since that team played together. "We defended well at times and some of our basics were good. "Leinster in the semi-final should be brilliant. They had a fantastic win against Toulouse." Munster: S Payne; J Kelly, T O'Leary, T Halstead, I Dowling; R O'Gara, P Stringer; M Horan, J Flannery, J Hayes, D O'Callaghan, P O'Connell, D Leamy, D Wallace, A Foley. Replacements: Cullen for Dowling (80), Manning for O'Gara (80), O'Driscoll for Leamy (37). Perpignan: J Laharrague; C Manas, D Marty, G Hume, S Dawai Naulu; R Pez, N Durand; P Freshwater, M Tincu, N Mas, R Alvarez Kairelis, N Hines, S Robertson, B Goutta, O Tonita. Replacements: Dawai-Naulu for Grandclaude (77), Gaston for Alvarez Kairelis (59), Vaki for Robertson (63), Bozzi for Tonita (23).